Swords & Wizardry is undoubtedly one of the Old School games, one of the many legs of the OSR. But I’m not going to talk about that, quite. Even though it’s Swords & Wizardry Appreciation Day, I’m going to talk about something I think might be missing. I notice that there is no mention of education or training in Swords & Wizardry Core. There is a little bit about researching spells, and there are other methods of learning spells, but what about characters who aren’t Magic-users? Let’s see if we can’t do something about that. Let’s add ‘schools’ to Old School. Before we can really start, I think it necessary to establish the working parameters. First, I think we’ll completely ignore the training for advancement rules from AD&D. They are little more than an adventurer tax and not to my taste. Second, I notice the classes and abilities available are pretty straightforward selections, and I want to keep that. These rules will have to be optional. Third, anything gained through special training should be implemented in a way consistent with other rules. I like making use of previous art. Whether or not I use it as originally written, it generally saves me a fair bit of work. For what I want to do here, I see basically two primary resources available. One is the Principalities of Glantri Known World Gazetteer. It has special magical traditions you can become trained in to gain special abilities… if you’re a magic-user. Other classes need not apply. I could probably extend the mechanisms to cover abilities for other classes, but that comes close to starting from scratch. Also, this is not Open Gaming Content, so I’d probably have to keep it to myself, or file the numbers off really hard. Between the two, I think it’s more work than I want to do tonight. The other is a set of four books written for the d20 Legends & Lairs series (Open Gaming Content, huzzah!) from Fantasy Flight Games: Path of Magic, Path of the Sword, Path of Faith, and Path of Shadow. These focus respectively on arcane characters such as wizards and sorcerers, martial characters such as fighters and barbarians, divine characters such as clerics and druids, and sneaky characters such as rogues. There is overlap between them also for the ‘mixed mode’ characters such as paladins, rangers, and bards. Each of the four books I mentioned has the idea of specialized training in an academy or with a traveling master. They are called different things in each book, but the rules for applying them (learning the lessons and advancing) are the same. Path of Magic has Magical Traditions. Path of the Sword has Schools of Combat. Path of Faith has Disciplines of Faith. Path of Shadow has Shadow Schools. The books typically also include feats, prestige classes, and legendary classes (basically special prestige classes), plus things more specific to each book, but the specialized schools are of primary interest here. Each specialized school consists of ten lessons, each of which has a minimum level requirement, an experience point cost and time cost to study, and typically some kind of fee (gold cost) to the instructor, and each gives an ability other characters don’t have. This looks like a pretty good fit. When studying a magical tradition, a character must start with the first lesson and study them in order. Each has a minimum level requirement and experience point cost, and requires a certain amount of time to study as shown in the table below. Obviously, some things will need to change for this to work in Swords & Wizardry. The experience point costs are laughable if applied to Swords & Wizardry because the experience point requirements climb so much higher than in D&D 3.x. Rather than having a negligible experience point cost to the lesson, I think it might work better to have the lesson provide a surcharge to the experience points needed to gain a level. Each lesson learned increases the experience points required to advance to the next level by 5%. The Referee can choose whether this applies to levels from the time the lesson is completed (so a fifth-level Magic-user who has completed two lessons would need (40,000-20,000)*1.10 =) 22,000 experience points to advanced to sixth level), or whether it changes the table as a whole and the character has some catch-up to do (instead of needing a total of 40,000 experience points to advanced to sixth level, the fifth-level Magic-user needs a total of 44,000 experience points). The study times required would probably be okay, but it might be worth slowing things a little. Let’s say each lesson requires a number of weeks equal to the lesson number (so a total of 55 weeks to go from no training to completing the tenth lesson, if nothing gets in the way). The minimum level requirements, though, might need to be adjusted. I expect most Swords & Wizardry games might get up to 500,000 experience points or so (Cleric 14, Fighter 11, Magic-User 12), cutting out the possibility of achieving higher lessons. Let’s instead say that in order to learn a lesson you must have a level at least as high as the lesson. It might be better to require that the character be a higher level than the lesson number, so the capstone ability is gained no sooner than eleventh level. This assumes a trainer is available. I think if a trainer is not available it could still be possible to learn things (someone had to originally, after all), but it should likely be harder. Making the time required for each lesson equal to a number of months equal to the lesson number is probably appropriate if one person could develop an entire tradition in his lifetime, but even if it were scaled to years it could be possible in a human lifespan. It might be just barely, but establishing a new tradition from first principles is a pretty difficult thing. In this case it might even be reasonable to make the baseline measured in months rather than weeks. This could see someone go from untrained to full mastery in 55 months, a little less than five years. I think this should be a Referee call based on the campaign expectations. If advancement is fast (by game calendar), weeks and months may be the correct scale, while if advancement is slow (by game calendar) months and years might suit better. I have no problem with someone choosing to take more than one school. The time requirements and experience point adjustments accumulate regardless of lesson number (that is, learning “lesson one” from three schools causes the same experience modifier as learning “lesson three” from a single school, though it can be done in half the time). These are adapted pretty much directly from the books. I’m going to adapt mechanics somewhat. The names are pretty transparently modified from the original. Many school abilities in the reference books give bonuses to skill checks. As Swords & Wizardry does not have skills, I’m going to rule that generally if a school ability would grant a bonus, here it will allow the student to make a check (if most characters couldn’t) or automatically succeed (if most characters could make a check). A check is generally a d20 roll, aiming to be equal to or less than an appropriate ability score (usually the ability score to use is obvious, but the Referee will decide). A ‘blind check’ is one made by the Referee; the student does not learn the result until the consequences are known. I would be inclined to also throw in a small quest, test, or something similar that demonstrates advancement along the path of knowledge. If you want to learn dragon magic, study of and interaction with dragons should be an important element of the training. Despite the name, these are not the classic “burn it with fire” spell casters, but characters who delight in making things go boom! Originally presented in Path of Magic, but I see no real reason why only Magic-users could do this. Alchemy Instructional: The student learns to identify combustible and explosive materials, and what will set them off. The Red Thumb: with a moment’s concentration and a flick of the fingers, the student can produce a candle-sized flame on one finger. This flame is not enough to cause damage, but can be used to set flammable objects on fire. Little Snappers: The student can make one ‘snapper’ per lesson completed per day; each snapper lasts only one day. If applied as a weapon (thrown a short distance or attached to a missile) a snapper can do one point of damage. Sparks: Once per day for a minute per lesson completed, the student can cause himself to be surrounded by hundreds of glowing sparks. These are harmless, but bright enough that in dark conditions dazzle opponents (improve AC by two points against sighted attackers) and lights up a 10-foot radius. Firewalker: The student gains a +2 bonus on saves involving fire. Burning Poker: Three time a day, the student can cause a melee weapon to do +1d6 points of damage on a successful hit, for one minute. Kiss of Fire: The student can cast fire spells for greater effect, as if one caster level higher. Flaming Fist: Much like The Red Thumb, but the student’s entire hand bursts into flame. Three times per day for five minutes each, the character’s hand will do an additional 1d6 points of fire damage on a successful unarmed attack. As with The Red Thumb, the fire will not harm the student but may set flammables (including the student’s clothes) on fire if careless (Dexterity check or saving throw to avoid). Big Bangers: As Little Snappers (including number per day) but doing 3d6 points of damage. Cloak of Fire: The student gains fire resistance 10. Bodyguards without peer. Originally presented in Path of the Sword, but while I don’t imagine many Magic-users would take this, I can see some Clerics doing so. Lead Footing: The student gains a +2 bonus to saves and ability score checks to resist being tripped, knocked down, or otherwise moved against his will as long as he has something to brace against. Being picked up by giants or dragons, well…. Defensive Stature: The student’s Armor Class is improved by 1 when using a shield. Block Arrow: If the student only defends in a round, he gains twice the normal benefit (including magic) from his shield against ranged attacks. Defend Ally: The student can grant his shield bonus to an adjacent ally. Stubborn Will: The student gets a +1 bonus to any attempts to control his mind. Defensive Nature: Effects of Defensive Stature are doubled (Armor Class is improved by 3 when using a shield). Disarming Blow: The student can attack an opponent’s weapon (same Armor Class as the opponent); if successful and more damage is done than the target weapon can do, the target is disarmed and the weapon lands out of reach. Unexpected Charge: The student can charge and move past creature without suffering free attacks from creatures passed (per ‘Movement within Melee’, if that optional rule is used). Alternatively, the student can close up to twice the normal distance (24′ for a creature with a movement rate of 12) and attack an opponent with a +2 bonus. Referee choice. Energy Resistance: The student gains a +2 bonus to saves against one type of energy (fire, cold, electricity, etc.) chosen at the time this lesson is learned. Alternatively, the student gains energy resistance 5 to one type of energy chosen at the time this lesson is learned. Referee choice. Damage Reduction: When wielding a shield, the student reduces damage to him done by mundane attacks by two points per attack. Harvest the plants, do useful things with them. Originally presented in Path of Faith, but again, I don’t think this needs to be restricted to Clerics. Herblore: The student can identify plants and their uses. Edibles and Poisons: In suitable terrain, the student can safely forage for food (plants, mushrooms, and so on). Tea Reading: Once per day the student can read tea leaves and make a blind Wisdom check to predict whether a particular action or activity (resolvable within an hour) is likely to end well or poorly. Healing Salves: The student can use salves and poultices to stabilize and revive an unconscious creature. Subject gains one hit point per minute of treatment until conscious (having one or more hit points) again. Extract Poison: The student can use salves and poultices to treat poison (subject receives a second save). Cure Disease: The student can use salves and poultices to treat disease (subject receives a second save). Healing Oils: The student can use salves and poultices to treat injury. Subjects recover hit points twice as fast while treated. Dispelling Incense: The student can use salves and incense to break enchantments (subject receives a second save against mind-controlling influences). Advanced Potions: One per day the student can brew a potion from herbs and plants. Each potion takes one hour and is viable for only one day. Mastery of Plants: Once per day the student can speak with plants (as the spell). 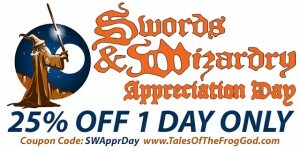 I have been chosen to give away a PDF copy of Swords & Wizardry Complete. It was not identified how, so I’m going to make something up. If you want to be absolutely certain of getting something, though it won’t be free, there are sales on Swords & Wizardry products at Frog God Games and the Swords & Wizardry SRD site. 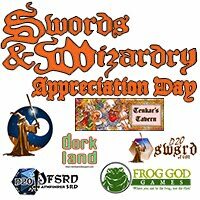 Frog God Games themselves are offering 25% off all non-subscription and preorder products for S&W with the code SWApprDay at their website. If you buy a print product, you get the PDF as well! The online store for the S&W SRD is offering a 25% off sale on first and third party S&W products in PDF format. The coupon code is SWAD252013. You can visit their website here. Swords & Wizardry Appreciation Day, “O” in the A-Z Challenge, and suitable for Seekers of Lore. Very cool! No idea if I could add these to my own game yet or not, but they are very cool. I’m glad you like it. The conversions are a little rough yet, especially since some of the abilities depend on mechanics that as far as I can tell don’t exist in Swords & Wizardry. I tried to get close to the spirit of the originals, and I hope I simplified the rules for gaining mastery in the school. I think I found a decent balancing mechanism in terms of experience point costs. The ones present in the original are pretty small, even smaller when you consider the geometric relationship of experience points and level in Swords & Wizardry. I think the abilities themselves are generally pretty reasonable for the level they can be gained. Overall I’m satisfied with how this looks as a first pass, but I think it could use some refinement. Or perhaps, reversing the emphasis of that last sentence: I think it could use some refinement, but I’m satisfied with how this looks as a first pass. Pingback: Swords & Wizardry Appreciation Day Contest | Keith Davies — In My Campaign - Keith's thoughts on RPG design and play. Hmmm… Kind of an OSR take on Prestige Classes, in a way. I hadn’t considered it quite that way, but I imagine they could fill a similar niche. In fact, it might do a good job of it, come to that. Dabble a bit and pay a small surcharge, pursue it rigorously and pay a big surcharge but gain some significant character-specific benefit. If the abilities can be tuned well enough, you might be able to use this to model ‘in-between’ characters. A cleric might take a particular school because it enhances his divine power, but a fighter might do much the same (and become a ‘paladin’). A thief might take something nature-based and become a hunter (ranger), a cleric might do so and become a ‘druid’. I like this idea. Thank you for mentioning it, I hadn’t even considered this application. 1. Quick Strike: The student learns to use finesse and speed to fight. When using a rapier or dagger, the student may now use their Dexterity in place of Strength to determine to-hit bonus. 2. Flourish: The student learns to use elaborate moves to confuse opponents during an attack (-1 on next attack roll). Can be used once on each opponent per combat. 3. Nimble: The student may ignore 10 feet of difficult or cluttered terrain when moving in combat. 4. Quick Parry: The student gets a +1 bonus to armor class when using a rapier or dagger. 5. Impressive Flourish: Similar to Flourish except it causes the student’s opponent to lose their next action. 6. Defensive Stance: The student may not make any attacks that round, but gains +4 to armor class (in addition to the +1 for Quick Parry). 7. Arrow Parry: The student may deflect one small projectile (arrow, dart, etc.) per round. 8. Acrobatic: As nimble, but the student ignores up to 20 feet of difficult terrain in combat. 9. Quick Blade: After a successful attack, the student may make a second attack roll at -4. 10. Grand Display: Similar to Flourish except the student causes all opponents able to see him to lose their next action. Can only be used once per combat. I like it, Todd. A mix of mobility and defensive benefits suitable for a lightly-armored fighter (though none of them seem impeded by heavy armor), and for a thief, if you use that class. If I wanted to add some more offensive capability I might trade Impressive Flourish for something like “Riposte: When your Quick Parry or Defensive Stance prevents a hit, you gain a free counterattack”. I’d rather give the duelist an additional attack than remove all option of action from the opponent — similar net effect, to be honest, but doesn’t sting as much. In fact, it might even be better for the duelist, if he gets surrounded, because as worded he could get more than one free attack. I like the image, though. Grand Display might work better if it makes opponents shaken for a round instead of losing their action, but as written it’s a nice capstone to have available. I assume that running along heavily-laden banquet tables, swinging from chandeliers, and sliding down wall hangings count as navigating difficult terrain, yes? Exactly the kind of terrain I had in mind (or ship rigging, etc.). Kung Fu is an ancient martial arts learned in dojo, monastery and from traveling masters. Renowed in the area are the Dojo of Master Fei-Lon (in the big city, double the cost, need to convince the master himself to be a worthy student), on the mountain nearby there is the isolated Monastery of Shang-Ki a lesser deity of the zone (LN, fight honoraubly, perfect yourself, protect the weak) where student will be accepted if the swear to follow the teaching of Shang-Ki. A renowed if strange teacher is the (in)famous Jack Lee a peerless master (Fighter 11th + all 10 lesson of this school) but with a strange curse (must get drunk each day before sunset) so while he is an incomparable fighter it’s quite complex to follow him… to be accepted as his student you must drink with him…. How would this interact with another such martial art? If you have two different kinds (hard vs. soft, with little or no overlap) it might be pretty straightforward, but what if they are similar? Pingback: Old School: Kung Fu | Keith Davies — In My Campaign - Keith's thoughts on RPG design and play.